I just thought I would share with you a recent commission I have completed. I don't want to say who it was commissioned by incase she hasn't sent out the invites yet! I also took off all the text so her wedding can remain anonymous! 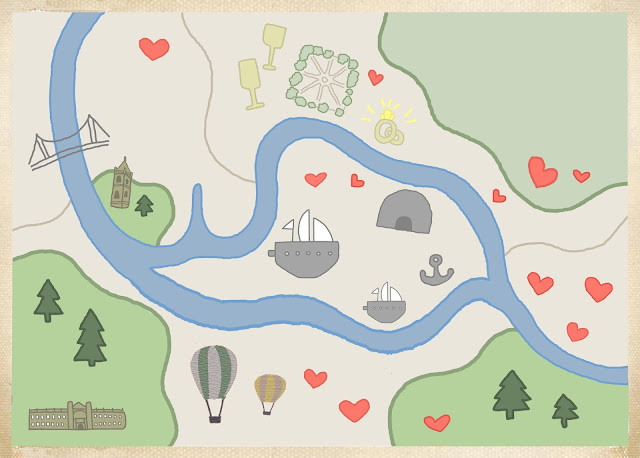 The client asked for a treasure map type theme with Bristol locations. She showed me an example of another illustration that she had liked and it was right up my street, simple lines and colours and a childlike feel. I chose to use the same colours as in the local Bristol tourist map to tie in with the bristol theme. Luckily it is a city that is full of parks and rivers so there is lots of colour!